Jaguar is ready to smash open the SUV market with its new 2017 F-Pace that is packed full of features and already a record breaker. Unveiled at the Frankfurt Motor Show, the sports car/SUV is based on the impressive C-X17 concept detailed at the same show two years ago and the roomy car has plenty of features to please petrol heads and families alike. Under the aluminium monocoque body there is a choice of three different engines. The petrol version includes a three-litre twin-vortex supercharged, direct-injected 340bhp V6 or there is a 380bhp version of the same engine, and they do 0-60 in 5.4 seconds and 5.1 seconds respectively. The turbo-charged, two-litre, in-line four-cylinder Ingenium engine brings 180 bhp to the table and does 0 to 60 mph in 8.2 seconds. Those engines are complemented by double-wishbone (front) and integral link (rear) suspension and this is backed by Jaguar's Adaptive Dynamics, which monitors body movements 100 times a second and wheel movements 500 times a second thus providing variable damping that adapts to the conditions. The F-Type is defined as an all-wheel drive car but only uses it when required as yet another piece of tech, the Intelligent Driveline Dynamics (IDD), shifts traction depending on the situation to make sure it is present whilst still retaining the feel of a sports car. It also features Autonomous Emergency Braking (AEB) that automatically applies the brakes when a hazard is present and the same cameras are used for the Lane Departure Warning and Lane Keep Assist alert systems. For anyone that has a problem speeding, the car features Traffic Sign Recognition to warn of speed limits and an Intelligent Speed Limiter that takes control of the throttle to keep the car in line with the laws of the road. Chief among the interior innovations is a battery-less and waterproof wristband known as the Activity Key. 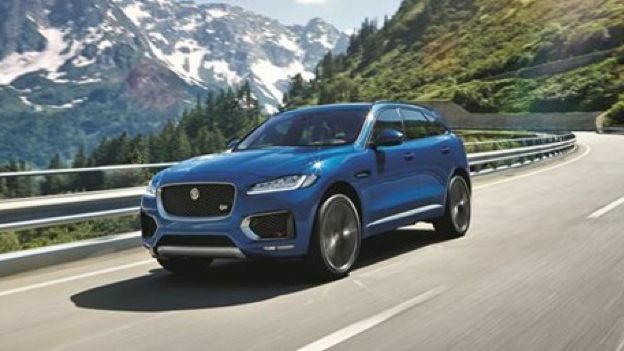 It takes the place of all keys and fobs, and can be left in the car for when you partake in watersports before getting back in by flashing the band close to the 'J' in Jaguar on the tailgate. On the entertainment front there is the InControl Touch Pro system that uses a speedy 60GB SSD and ultra-fast Ethernet network to project information onto the 10.2-inch touchscreen, which brings crystal clear 2D and 3D GPS navigation into the car. Pricing starts at $40,990 (£26,200) and tops out at $56,700 (£36,250) and the car will be released in the US in 2016 with details on a European launch so far unavailable.